Image Size: 13.5" X 9"
Paper Size: 29" X 21"
In 1959, the Boeing Aircraft Company responded to a Pan American World Airways request for a larger, long-range version of the original 707 jetliner. This improved version - the “Intercontinental” Model 320 - weighed 168 tons at takeoff and could carry 180 passengers over routes of up to 4,000 miles nonstop. 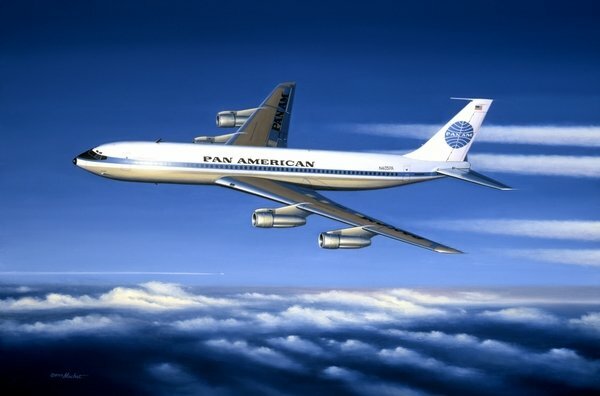 Mike Machat’s painting depicts Pan Am’s historic inaugural airline service between New York and Moscow on July 15, 1968. Contrails on the horizon are those of an Aeroflot Il-62 flying the reciprocal service from Moscow to New York, an event attended by the artist at JFK Airport. Our Un-Stretched Option- When you purchase an un-stretched print from Virginia Bader Fine Arts you will get your image and a colored border surrounding the image. This colored border will enhance the image when it is stretched onto stretcher bars and will be seen on the edge in order to accent the printed image.